With medical marijuana now legal in 30 states, the cannabis business is booming across America, with a thriving niche market for distributors. 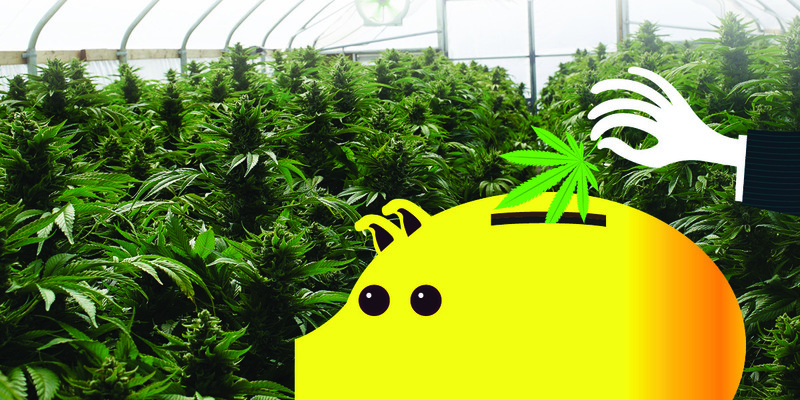 There are several gases used in cannabis production: propane for CO2 generators, gas CO2 for emitters and a variety of gases used in extraction systems. According to Jana Nelson, president of OXARC, Inc., the legalization of marijuana in Oregon and Washington state has opened a big market for gas distributors, and supplying CO2 to cannabis farmers is now a significant portion of OXARC’s business. Carbon dioxide is essential to plant processes. During daylight hours, plants store energy by converting CO2 into sugar in the process of photosynthesis. At night, plants use the energy produced for life functions (e.g., growth and flowering) and release CO2 in the process of cellular respiration. Studies on the effects of increased CO2 on plant production have been ongoing since the early 1970s, and it is now widely accepted that the controlled introduction of supplementary CO2 in greenhouses and grow rooms can result in improved growth rates and higher yields. Plants take in CO2 from the atmosphere via the plant’s stomates, which are microscopic openings or pores typically found on the underside of leaves. Plants use CO2 in combination with sunlight captured in chlorophyll and water/nutrients taken up by their roots to produce both sugar (glucose) and oxygen. The sugar is used by the plants to grow while the oxygen is released into the air. Atmospheric CO2 is approximately 400 parts per million. Studies show that increasing CO2 to a certain point above this level can improve plant growth as long as adequate lighting, water, temperature, humidity and nutrients are also provided. In cannabis farming, CO2 levels above 400 ppm will increase cannabis plant growth and yield. It is important to note that different plant varieties have different levels of optimal CO2, and values also vary depending on where the plant is in the growing cycle, with CO2 requirements for cannabis typically being higher during the vegetative stage (e.g., 1,200 ppm) than they are when plants are in the flowering stage (e.g., 900 ppm). Carbon dioxide must be measured carefully in enclosed spaces, as levels below 400 ppm or above 1,500 ppm have a negative impact on plant processes. If a grow room is sealed and fresh air is not supplied, the CO2 level during daylight hours will drop below 400 ppm, and growth will cease at levels below 200 ppm. For that reason, grow rooms must be supplied with a constant flow of fresh ventilation air or supplemental CO2. On the other end of the spectrum, excessive levels of CO2 cause the stomata on plant leaves to close, halting photosynthesis and preventing the plants from transpiring water vapor, which can result in scorched leaves (commonly referred to as CO2 burn). When introducing CO2 into a greenhouse environment, remember that CO2 should only be supplemented when the lights are on, as that is the only time in which it is used. High-pressure sodium or LED lights are preferred over fluorescent lamps, as they provide the higher light levels required when supplementing with CO2. Keep air temperatures at optimal levels. Warm air temperatures speed up photosynthesis and CO2 intake, but if temperatures get too high, leaf stomata will close to conserve water. CO2-enriched plants benefit from temperatures that are 3 to 5 degrees higher than plants in non-enriched spaces. Maintain the relative humidity between 40 and 60 percent. At lower humidity levels, leaf stomata close, reducing CO2 intake. Tightly spaced plants increase the need for carbon dioxide supplementation. 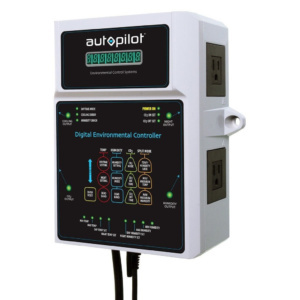 Controllers are used to maintain ideal environmental conditions in a greenhouse or grow room. Emitter systems use perforated tubing to disperse CO2. This 10-burner generator is designed to be suspended from the ceiling and can be fitted to burn either propane or natural gas to produce CO2. There are several methods of increasing the CO2 levels in an indoor farming environment, including CO2 bags, buckets, emitters and generators. A controller is often used in larger greenhouses to monitor CO2 levels, temperature and humidity. CO2 bags and boost buckets – CO2 bags and boost buckets typically contain mycelium, a fungus found in soil that provides an excellent source of CO2. The fungus grows on organic matter inside the bag or bucket, and a one-way breather patch is used to expel the CO2 produced into the grow room. Some CO2 boost buckets are vented with a small electric pump to enhance distribution and include tubing that can be run to the center of a group of plants or fan intake. These devices are limited in that they can only serve small areas and have an expiration date (from three months to a year, depending on the device), after which they must be refilled or replaced. Once the bag or bucket has expired, the contents can be reused as a topsoil fertilizer. CO2 generators – CO2 generators burn propane or natural gas and produce carbon dioxide and water vapor as byproducts of combustion. They are simple to operate and can be set up to automatically power on or off when CO2 levels reach a specific concentration. However, burning fuel presents inherent safety hazards and increases both temperature and humidity. Temperatures above 80 degrees F can result in elongated stems and lower yields. Because of this, CO2 generators are better suited for larger grow spaces that are equipped with climate control systems. Some growers use bottled CO2 and emitters in the summer, since they do not produce heat or humidity, and CO2 generators in the winter, when the extra heat and humidity are a welcome byproduct. Note that generators must be rated for indoor, horticultural use and provide complete combustion of natural gas or propane with a pure, blue flame. Incomplete combustion can produce waste gases that are harmful to people and can potentially damage the crop. CO2 emitters – CO2 emitters (also known as dosers) attach to tanks or dewars to distribute compressed CO2 in controlled quantities. 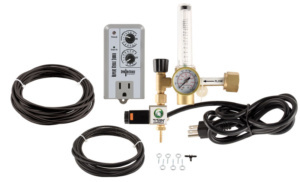 An emitter system includes a pressure gauge, solenoid valve, timer, flow meter and tubing. Because CO2 is heavier than atmospheric air, it is better to distribute it from above so that it will fall onto the plants. Emitters can be connected to an overhead CO2 “rain” system, which consists of perforated tubing that allows the CO2 to fall in an evenly dispersed pattern. Oscillating fans are used to improve gas distribution. 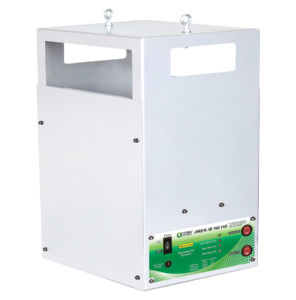 The benefit of this setup is that it is less hazardous than a generator and does not introduce heat. Controllers – Generators and emitters are often equipped with controllers that monitor CO2 levels, temperature and humidity. If the temperature or humidity exceed predetermined set points, exhaust fans are turned on to purge the room. To conserve CO2, the generator/emitter is shut off during the purge cycle. A photocell in the controller senses when the lights are off, turning off the CO2 at night when plants don’t require it. Some controllers also include CO2 monitors. If levels fall below a minimum set point, the monitor sends a signal to the controller to turn the system on. When the target is reached, the monitor sends another signal to turn the system off. This permits precise control as well as maximum efficiency. In addition to the CO2 used to enhance yield, carbon dioxide as well as other gases are also used in marijuana production. These gases are known as solvents and are used in the extraction process. This duplex unit has the ability to perform both supercritical and subcritical extractions. Cannabis plants produce two well-known cannabinoids, THC (tetrahydrocannabinol) and CBD (cannabidiol). THC is the primary psychoactive compound in marijuana. Unlike THC, CBD does not produce psychoactive effects. Although the U.S. Drug Enforcement Agency has not officially ruled on the topic, CBD products that do not contain THC are generally considered as falling outside the scope of the DEA Controlled Substances Act, which means CBD products are legal to sell and consume. CBD products, including CBD oil, are becoming increasingly popular, and in 2018, Business Insider reported that CBD products now represent roughly a billion-dollar industry. Applications of CBD oil are growing at a phenomenal rate, and these products are now used in topical, vapor and edible forms to reduce inflammation, provide pain relief, reduce nausea related to cancer treatment and treat symptoms related to multiple sclerosis, anxiety and Parkinson’s disease. Cannabis treatment in people with certain forms of epilepsy has been particularly promising. In June of 2018, the FDA approved the cannabis-based drug Epidiolex, a CBD oral solution for treating two rare and severe forms of epilepsy. This is the first FDA-approved drug that contains a purified drug substance derived from marijuana. CBD is extracted from cannabis using a solvent to separate the oil from the plant. Extraction solvents include propane, butane, hexane, pentane, ethanol/alcohol mixtures and CO2. Butane is currently the most common extraction solvent due to its high efficiency and lower system price point, but CO2 is gaining popularity. Carbon dioxide usually behaves as a gas at standard temperature and pressure or as a solid when frozen (dry ice). When CO2 is held above its critical temperature (87.98 degrees F) and critical pressure (1,071 psi), it expands to fill a container like a gas but has the fluid density of a liquid. This is known as supercritical CO2. During the supercritical extraction process, plant material is placed in an extraction vessel, and then CO2 is pumped into the vessel under high pressure. This process converts the CO2 into a fluid, which then passes through the plant material, extracting the oil content. The liquid CO2 and plant extract mixture is then pumped into a separator vessel, which converts the CO2 back into a gas, separating it from the oil. This process is repeated several times until the extraction is complete. The resulting product may then be subjected to a process known as winterization, which uses ethanol and cold temperatures to separate fats, waxes and lipids from extracted oils. It is commonly used to manufacture the light oils used in vape pens. Some extraction units are also capable of processing subcritical extractions. Subcritical CO2 is liquid CO2 held below 87.98 degrees F. It is ideal for extracting and preserving light oils from plant material and has the advantage of not requiring winterization. Carbon dioxide is chemically stable, low-cost, non-toxic, non-flammable and readily available, making it an ideal extraction fluid. CO2 extraction is also considered a “green” process due to the lack of volatile organic compounds found in most other solvents. In addition, it is a very efficient process that recycles 90 percent or more of the CO2. 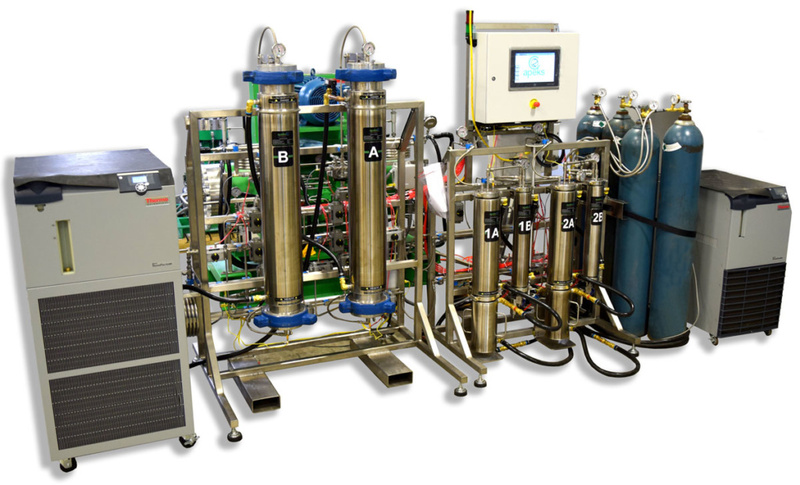 With CO2 extractions, there are no residual components in the extracted material. Other extraction solvents require additional processing to separate the solvent from the extracted oil and are considered less pure due to the presence of potential residues. Carbon dioxide is considered a Generally Recognized as Safe (GRAS) solvent that leaves no residue in the product. GRAS is the U.S. Food and Drug Administration designation that a chemical or substance is considered safe and is therefore exempt from the Federal Food, Drug and Cosmetic Act (FFDCA) food additive requirements. A conversation between our publisher, Bill Brod, and George Ratermann of Ratermann Manufacturing led to a new feature in Welding & Gases Today. George pointed out that there are many pockets of gems to be mined in this industry and suggested that we begin highlighting these niche markets as a service to GAWDA members. This story was the first in what we hope will be a series of Riches in the Niches. If you have any ideas for this series or other articles you would like to see, please send them to editorial@gawdamedia.com. Extraction – Supercritical CO2 is used in the extraction of spices, flavors, natural food colorings, hops, caffeine, nicotine, oils, fragrances, herbal supplements and numerous other consumer products. Because the solubility of many extracted compounds varies with pressure, CO2 can be used for making selective extractions via a process known as fractionation. Purification – Supercritical CO2 is used to remove pesticides and other contaminants from agricultural crops. Microparticle, Nanoparticle and Aerogel Production – Supercritical CO2 is used to create microparticles and nanoparticles for food powders and pharmaceuticals. It is also used in the production of aerogels. Sterilization – Supercritical CO2 is used to sterilize tissue grafts. It is also used to sterilize biological materials and medical devices when combined with peracetic acid or other additives. Dry Cleaning – Supercritical CO2 is an environmentally friendly alternative to traditional dry-cleaning solvents. HVAC Systems – Supercritical CO2 is used as a natural alternative to hydrocarbon refrigerants in state-of-the-art heat pump systems. Soil Remediation – Numerous studies are underway to identify the at-scale use of supercritical CO2 in soil remediation. Potential applications include soil contaminated with pesticides, petroleum or other chemicals as a result of deliberate application, spills or industrial processes. Polymer Production and Processing – Applications of supercritical CO2 in polymers include polymerization, polymer composite production, polymer blending, particle production and microcellular foaming. Electronics Manufacturing – An emerging application is the use of supercritical CO2 in electronics manufacturing. The low viscosity and surface tension of supercritical CO2 allows for the safe and efficient cleaning of microminiature circuits. 1. For more information on the applications of supercritical CO2 systems for power generation, refer to the full article at www.conceptsnrec.com/blog/is-the-supercritical-carbon-dioxide-market-reaching-critical-mass.